A number of Doctor Who script books have been issued over the years, covering both TV and audio adventures. 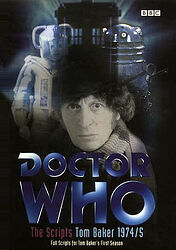 From 1988 to 1994, UK publisher Titan (best known for graphic novels) published a range of 10 script books representing a selection of TV stories from five of the seven "classic series" doctors, most notably including The Masters of Luxor, an unmade script from the Hartnell era. Starting from 2002 onwards, audio producers Big Finish have released regular volumes (5 so far) containing scripts from both their New Audio Adventures and Dalek Empire audio drama ranges. The BBC have also dipped their toe into the water: Apart from publishing the script of the 1996 TV movie, in 2001 they published a book containing all 5 scripts from Tom Baker's first season as the Doctor, followed by a book of shooting scripts for the 2005 series starring Christopher Eccleston.